First and foremost: there is no such thing as a cylinder block that was unique to the 428 Cobra Jet and Super Cobra Jet engines! By the time these engines were produced, Ford was using the same reinforced block for all 428 applications. It's more appropriate to call the block a reinforced 428 block than a "428 Cobra Jet" block. 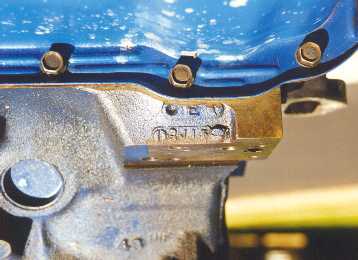 Reinforced 428 block identification has proven to be a vexing problem for Ford enthusiasts. When you consider that Ford often mixed and matched casting molds among multiple FE (Ford-Edsel) engines it becomes extremely difficult, if not downright impossible, to identify a reinforced 428 block on sight without considering several clues. Sadly, I believe that the short answer is that it is impossible to identify a reinforced 428 block with complete confidence while the block is installed in a vehicle. Read ahead and form your own opinion! So you're looking at a block and wondering if it's a reinforced 428 block. Ford made a lot of FE engines during the 1960s, so these blocks are still quite common in cars, trucks, and at swap meets. That's good news if you're looking for a 390 or passenger car 428, but bad news when trying to determine if the engine installed in the Mustang you want to buy is in fact a 428 Cobra Jet (believe me, I know!). Thankfully there are a few external clues that can help narrow the search space somewhat. 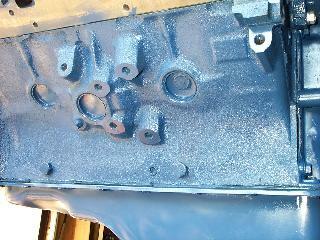 Engineering numbers on FE blocks of the 428 CJ era will be found on the front passenger side of the block, if present. Engineering numbers on FE and FT (Ford Truck) cylinder blocks cast since 1966 no longer indicated the type of block, but became a leftover formality from earlier days when the foundry had far fewer block variations. As the decade closed, the Dearborn Iron Foundry (DIF) and Cleveland (C) Foundry would stop placing these deceptive engineering numbers on new engine block patterns. The engineering numbers would return when the new Michigan Casting Center (MCC) started producing FE and FT blocks in the early '70s. MCC blocks would not contain the familiar "352" marking of years past, but would instead use "105" as a general identifier. The picture above shows a 428 block that lacks engineering numbers. Engineering numbers that appear frequently during the CJ era include C6ME, C6ME-A, C7ME, C7ME-A, and C8ME, but beware -- these markings do not indicate a specific block whatsoever, since any FE or FT block of the period can be found with any of these numbers. 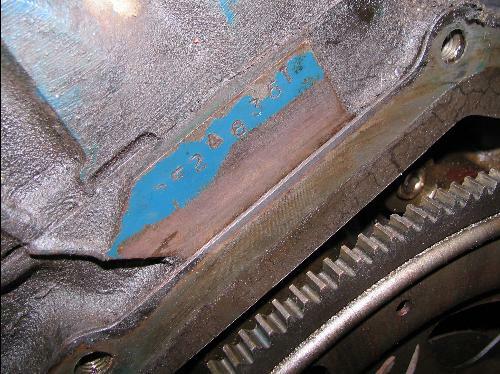 The service part number for all 1966 - 1970 428 blocks is/was C6AZ-6010-F.
Take a close look at the bottom edge of the block above, just above the oil pan rail. 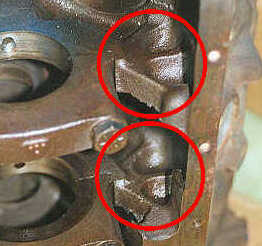 See the two bolt heads? These are unrelated to the famed cross-bolt bosses. The function of these two threaded and blind holes is to fixture the block for machining on the assembly line in the engine plant. Those familiar with cross-bolted main caps on late 406 and early 427 blocks will note these holes are in the same position as two of the cross-bolts. Since 406 and 427 blocks must be fixed for machining, these two cross-bolt holes are additionally tapped, so the holes provide the double-function of fixing for assembly and cross-bolting to reduce crank saddle stresses. Later 427 blocks use a slightly different hole pattern for fixing on the assembly line, so cross-bolts can be installed on the assembly line while the block is still fixed. 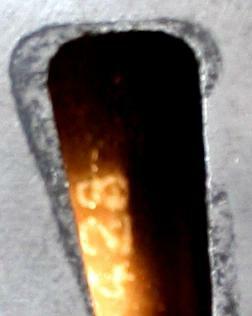 Some blocks have a "428" cast onto the floor inside the water jacket. 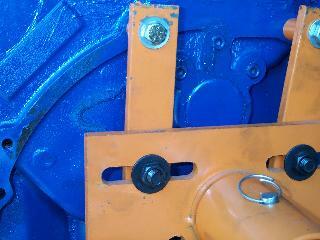 There are two common positions to view this protruding number: one is just inside the center freeze plug hole, the other is directly beneath the long coolant slot at the rear of the block. If present, you can be sure the cylinders are thick enough to support 428 pistons, core shift permitting. If the number is not visible from either position, you'll need to make other verification checks. Measuring the gap between cylinders using a drill bit is the easiest way to determine whether your block is capable of supporting 428-sized cylinders. It is presently thought that if the shank of a 15/64" drill bit will NOT fit between the cylinders at any reachable spot in the six core holes, the cylinder will likely handle a 428 bore, core shift permitting. 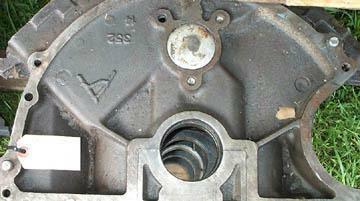 An FE block's casting date can be found just below the oil filter adapter on the front driver side of the block (see below). Casting dates follow typical Ford convention with the first character (a digit) representing the year, the second character (a letter) representing the month, and the last one or two characters (one or two digits) representing the calendar date in the casting month. The block in the picture above has a casting date of "9J15", which translates to September 15, 1969 -- early in the 1970 model year. Keep in mind that Ford first introduced the 428 Cobra Jet in April, 1968 as a mid-year option during the 1968 model year. There were earlier prototype and drag cars produced during calendar year 1967, so it's fairly safe to assume that block casting began no more than a few months in advance of production. 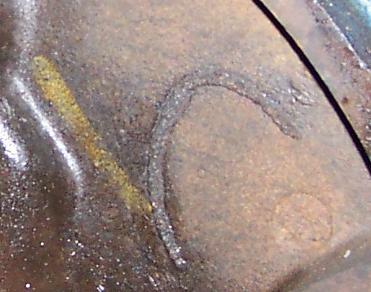 Over the years the "C" scratch has often been described to as "welded". We've included a picture of a mark made by someone that took that misconception literally. 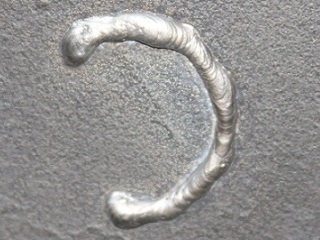 The weld is very smooth and the "C" is very well formed, which is totally opposite of the grainy backwards scratched marks we typically see (thanks to Kerry Wortman for the picture). I've also received reports from people who have found partial VIN stampings on the rear of the driver's side cylinder head. Given normal production line schedules and procedures I have no doubt that the person doing the stamping could put the marks in either place. One of the most telling clues can be found inside the engine. Thanks to Bill Lewis for the images! FE crank saddle webbing may be of either the standard or the reinforced type. Standard webbing, shown in the left hand photo, contains two ribs directed into the block's skirt. Reinforced webbing, shown in the right hand photo, adds a third rib running horizontally into the skirt. Many FE blocks have standard webbing and nearly all FT truck blocks, used in Series 500 to Series 800 heavy trucks, are of the reinforced type. Actually, all FT blocks are supposed to have reinforced webbing, but occasional deviations from this can be found. High performance blocks of 1960 - 1962 were the first FE blocks to contain the reinforcement ribs. 406 and 427 blocks also received reinforced webbing. This feature was carried into the 428 PI block in 1966 - 1970, and was inherited by the CJ and SCJ. Reinforced webbing became rather common in all FEs after 1973 or so, possibly because they were being worked hard in Series 100 through Series 300 light trucks. The days when Ford installed FEs in station wagons were long past. An article titled "Ford Enginuity" from the August 1987 edition of Muscle Car Review states that "All CJ blocks were cast with a misalignment in the oil passage in the #1 main web". I don't know if this situation is unique to the reinforced 428 block, but it is something to check for when rebuilding. 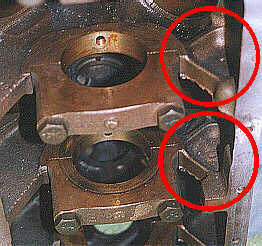 The solution is to radius the oil passage opening to match the hole in the bearing insert. Thanks to Al Trapanese for bringing this article to my attention. Thanks to Dave Schouweiler for his block identification contributions.